No matter if you’re leaving town to buy a new home across the country or relocating around the corner, moving is never fun. First off, there are tons of things you have to do. You have to find a new home, pack up all of your possessions, move them to your new location, clean your old home, clean your new home, unpack, organize, and more. This doesn’t even include all of the other logistics that can go along with moving, like setting up new accounts for utilities, switching Internet providers, and changing your address on pretty much everything. This list can be even longer if you’re moving to a new state. And, one of the most important things to add to this to-do list is to change banks. Before you get stressed out thinking about changing banks while in the midst of a move, we’re here to offer a helping hand. Take a look at the following steps to change banks. One of the very first things you must do is open a new account – ideally for free. Unfortunately, this might take a little legwork to find a bank with the best features for your lifestyle. For example, you may want a bank account with no fees. You may also want to pay bills online via a sweet mobile app. With these goals in mind, you may prefer an online only account, like Chime. Or, perhaps you’ll want to open an account at a bank with brick and mortar locations in your new state. The benefit of opening an account with an online bank is you’ll never need to worry about changing banks again if you move out of state. After deciding which kind of bank you prefer, you will need to provide identification, such as your social security number and a government-issued I.D. In addition, you will need a small amount of money to deposit into your new account. The minimum amount required can differ from bank to bank. In some cases, there is no minimum deposit required at all, such as the case with Chime. A debit card can be a convenient way to access the money in your new checking account, plus it’s also a good way to grow your savings. 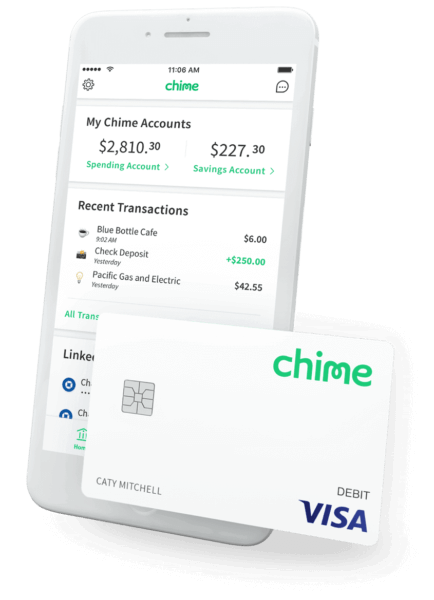 Some bank accounts, like Chime, offer programs that round up your debit card purchases and deposit those round up amounts into your savings. This spare change can add up over time to make a big difference. Keep in mind: getting a debit card for your new account may take some time, so make sure you factor in a week or two until your new card arrives. As soon as you have enough funds in your new account, you should set up automatic withdrawals to come out of your new account – instead of your old one. For example, you can set up automatic withdrawals to pay new creditors, such as your landlord, your mortgage company, your homeowner’s or automobile insurance, or your utilities. You can also schedule automatic payments to pay your credit cards bills, Internet provider, and any other monthly bills you need to pay. Automatic deposits are another area you must address as you change banks when moving out of state. Talk to your new bank and employer about setting up direct deposits of your paychecks to the new account. You should also set up automatic transfers into your new savings account too. Automating your savings can help you save money with each paycheck and reach your goals faster. For starters, make sure you don’t immediately close your old bank account when you move. The reason for this is that there may still be outstanding checks, transfers, or other transactions that have not been completed yet. Instead, monitor all of your accounts – the new and the old – until all of your pending transactions have cleared your old account. Once all of your transactions have cleared your old bank account, you are ready to close it. Next up: contact your old bank and let the customer service representative know you are closing your account and intend to deposit the money into your new bank account located out of state. You can then ask for a cashier’s check for the remaining balance. Moving to a new state is a difficult process, but changing banks doesn’t have to be. Hopefully these tips will help ease the stress of moving out of state by making the process of changing banks a little smoother. Have you ever moved out of state? How did you handle changing banks?